The BIRT team has released Milestone 2 of BIRT 2.0. This milestone release as some very nice features such as dynamic and cascading parameters, importing style sheets, a new expression builder, stored procedure support, and BLOB/CLOB support. BIRT 2.0 is shaping up to be a very cool release. Take a look at the features in milestone 2.0 at http://www.eclipse.org/birt/index.php?page=project/notable2.0M2.html and let us know what you think. John Ward over at the Digital Voice http://digiassn.blogspot.com, has posted two very good articles on setting up a Linux BIRT report server. The articles walk through a complete server setup, which uses Tomcat, wget, and Cron. Some of the key areas covered are publishing, deploying and even scheduling BIRT Reports. John, thanks for the articles. One of our active posters within the BIRT news group, who goes by "RAM" posted this article on accessing iSeries data. It is very nice when users in the community take the time to help others solve problems. This document shows how to get BIRT up and running on the iSeries. Step 1: If you do not have access to an iSeries machine, download JT400 from http://jt400.sourceforge.net/ and unzip it to a folder on your PC. For example, assume that you unzipped the file into c:\JT400. . Step 2: Inside this folder you will find another folder named LIB. IN this folder, you will find a file named JT400.JAR. 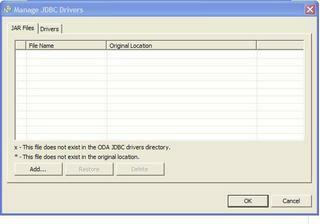 This file contains the JDBC drivers. 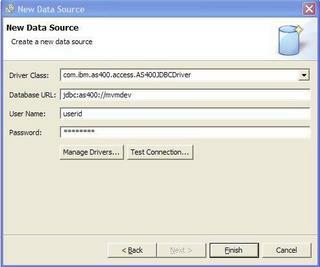 If you have access to an iSeries machine, you can find the file in folder /qibm/proddata/HTTP/Public/jt400/lib. Step 5: To design a report, double click the file named BIRT.EXE in the above folder. Step 6: Click on FileNew Report. Step 7: Type in a name for the report, click Next, select style and hit Finish. 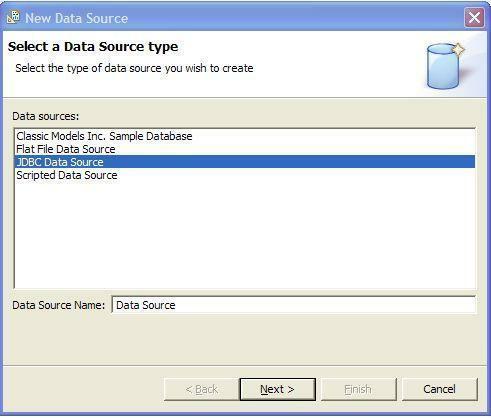 Step 8: Right click on “Data Sources” and select “New Data Source”. 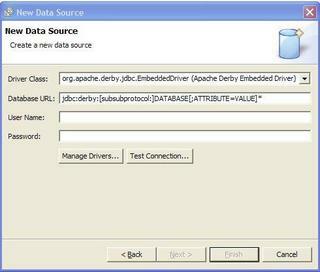 In the following window, select JDBC Data source and click Next. 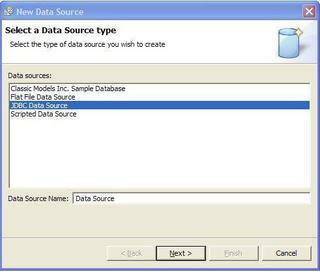 Step 9: The new data source window will appear as shown. Step 10: Click on the Manage Drivers button. This will bring up the Manage drivers window as shown below. Step 11: Click on Add, browse to the folder containing the JT400.JAR file and click on Open. This will add the JT400.JAR file as shown below. Hit OK.
You can test the connection using the Test Connection button. This should get you up and running in trying to design the report on the PC. Instead of using Tomcat 4.0.1 as stated by David Morris, just use Tomcat 5.0.28. Step 2: Download and unzip BIRT Runtime on to your PC from http://www.eclipse.org/downloads/download.php?file=/birt/downloads/drops/R-R1-1_0_1-200508091640/birt-runtime-1_0_1.zip. Step 3: Once the file is unzipped, look for the file named birt.war in the unzipped folder. FTP this file to the iSeries into folder /tomcatInstallationFolder/WEBAPPS, where tomcatInstallationFolder is the name of the folder where you installed Tomcat. Step 4: Re-start Tomcat. That should do it. Once your design is complete, upload your .rptdesign file into the /tomcatInstallationFolder/webapps/birt folder. Where filename is the name of the report design file. As you know, PHP is the technology of choice for many web site developers because of its simplicity and power. PHP applications, be they CRM applications, e-commerce applications, performance reports or help desk applications, usually require reports. However, even with PHP, creating reports for a PHP based web application can be tedious (Examples: a sales invoice, or a sales commission report). Yes, the first one is not too tough to do, but then you decide you need a second report, then a third -- and before you know it you are building a whole reporting product in PHP. Well, Zend and the Business Intelligence and Reporting Tools (BIRT) team are working together to combine the simplicity and power of PHP for your web site, with the simplicity and power of BIRT for your reports. The goal is to allow the PHP developer to easily add sophisticated reports to the feature rich PHP environment. While the details are still TBD, the teams are looking at creating PHP classes to easily run and view BIRT reports from within the PHP language. For those of you interested in using BIRT with Hibernate, the article provides a great starting point for a quick and not too dirty implementation of Hibernate with BIRT. Eventually, we will be providing an implementation of a Hibernate data source using BIRT, but that will probably have to wait until we get through the 2.0 release cycle. We are currently in the process of revising the examples section of the BIRT site. Take a look and let us know what you think. This list of examples will grow, so any suggestions or submissions are appreciated.